Widline Cadet is a Haitian-born artist. Her practice is deeply rooted in her experience as an emigrant/immigrant/migrant and explores the racial and cultural tensions and identity shifts that occur with dis-placement. Her performances, photographs and videos speak to a place that exists between where she was born (Haiti) and where she lives now (the United States); a place intimately familiar to every emigrant. Cadet is a recipient of a 2013 Mortimer-Hays Brandeis Traveling Fellowship, as well as a 2018 Skowhegan School of Painting and Sculpture artist in resident. Cadet earned her B.A. in photography from The City College of New York and is currently an MFA candidate at Syracuse University's School of Visual and Performing Arts. I’m thrilled to kick off 2019 with a conversation I recently had with Widline Cadet. I first came across Widline’s work on The Reservoir, and have seen her portraits flash across my screen from time to time including California Sunday Magazine’s special photography issue last month. Her portraits are stunning. Unflinching gazes, intertwined braids, and soft window light all evidence of her command of conveying intimate connection. I was very excited at the opportunity to speak with her, and she (of course) didn’t disappoint. This is definitely a photographer to keep an eye on. Zora J Murff: Hi Widline! I'm really excited to begin our conversation. Let’s start by getting to know you better. You’re currently an MFA student at Syracuse University. Can you talk about your relationship to art prior to attending grad school, and then a bit about how the program has shifted your approach to making? Widline Cadet: Hi Zora, thanks for having me. Looking forward to seeing where this goes! I went to undergrad at City College of New York and received my B.A. in Studio Art with a focus in Photography. Prior to that I started taking photography classes in high school. I was really lucky in many ways to have attended a sort of quirky, weird high school in NYC that had a focus on art, fashion, and business. As an art student, I was required to take a black and white photography class my junior year. That was when I had what people call an “aha” moment and fell in love with image making. In the beginning I was mostly mesmerized by the process itself that almost seemed like magic at the time, but over time—and after being exposed to many things and having various experiences—art and photography became this thing I couldn’t live without. In terms of how my making has changed since starting grad school, I think it has become a bit of a contemptuous relationship at times. That’s partly because of having to acclimate myself after being out of school for three years prior to attending grad school. In those three years I had a tremendous amount of freedom making work on my own time at whatever pace I set for myself. Making work and having deadlines for critiques is something I continually struggle with. ZJM: I remember my own bouts of "first-year discontent" well. That was quickly followed by "second-year malaise" and then "third-year blitheness". I kid...kind of. I've been asking people this question a lot lately, what was the first image you took in grad school (if you don't 'mind sharing), and in what ways do you think it was successful? WC: That's exactly what my progression has felt like up till now, except not always in a linear way. I’m pretty sure this is the first image (right) I made when I started school and I honestly did not appreciate it enough when I made it. Looking at it now, I think it was successful in terms of my intentions for wanting to make the picture. I felt a connection with the person in the frame and I wanted to communicate that to my viewer and i feel it does just that. ZJM: You took a pretty substantial break between undergrad and graduate school. Other than establishing a solid studio practice, what else do you think you learned during that time, and how has that shaped your experience as a photographer and artist? WC: I think consistency and trusting the process are probably two of the most important things I learned during my time away from school. I didn’t have a solid body of work when I finished undergrad and so most of the work that I have now was made during this weird period after undergrad when I had to learn how to juggle being out in the real world for the first time, making personal work and working to support myself doing random jobs that were in no way related to photography. I remember constantly questioning myself and the importance of the work I was making and why I was doing it. Let me tell you, self doubt can be such a crippling thing and so fighting through that, being consistent and trusting that even thought I may not know it now, there will come a point where things will start to make sense. It has. I will also say that the other thing I realized is the importance of having a community/support system or even just one person to talk with about making work outside of academia. These are things I have to keep reminding myself of now more than ever during my “second year malaise”, lol. ZJM: The portrait is really wonderful. Her posture reminds me of the figure in Christina’s World by Andrew Wyeth. But what I really love is her gaze, the window, and the mirror. Those are really nice, subtle touches. One of the reasons I wanted to reach out to you when I found your work was how striking your portraiture is. Was photographing people something you always found yourself drawn to? If so, why do you think that is? WC: Thank you, I love that painting!! I wasn’t immediately drawn to portraiture when I started making photos. 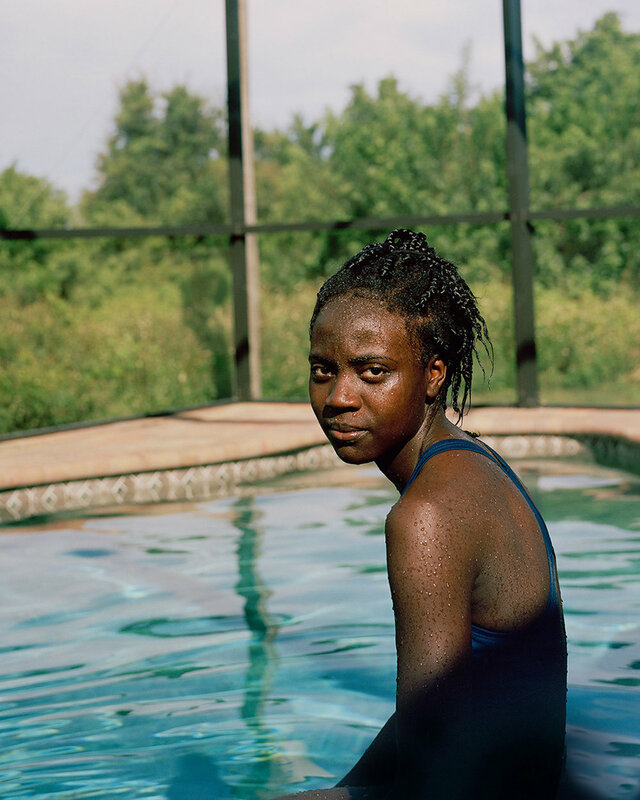 During undergrad, one of my professors looked at some of my contact sheets and lent me Katy Grannan’s book Model American and introduced me to Deana Lawson’s work. I became enamored with both artists. Later on, I became very drawn to portraiture as a way of filling a gap that was left by the lack of pictures and documentation of my family history. ZJM: I find your intention of building a family archive intriguing, and it’s something I started doing myself. Not in making images of my own family, but collecting photographs of other black families. This makes me think of representations of black individuals through portraiture, but before we dig into that, I want to keep focusing on you and your practice. Regarding your time off from school, you said that one of the things you learned was, “trusting the process”. I struggled with that early on in my own education and something I often witness with my students. Could you elaborate on that more? Were there any specific experiences you had that you feel helped you relinquish anxieties about control and allowed you to just make the work? WC: To be honest, I feel like trusting the process is something I still struggle with and have to relearn over and over again. When I say, “trust the process”, I actually mean trusting myself and my judgement. One particular aspect of that is attempting to actualize and give shape to certain feelings and ideas that are very personal to me. Ideas that I can’t communicate to other people with words, so I’m trying to make physical objects that match the ideas in my head and dealing with the inevitable disappointment of these to facets not syncing on the first, second, or even tenth try. That’s where I think trusting myself comes in. Believing that at some point I’ll obtain synchronicity between what I envision and what I make. It’s a matter of trial, error, time, effort, and consistency among other things. I don’t know if that makes sense, but that’s been my experience. ZJM: That makes perfect sense, and I’m sure there’s plenty of other artists who have the same feelings. In my opinion, I think the greatest artists are constantly asking themselves those questions—but more importantly—don’t wallow in them and work to find the answers. So speaking of finding answers, would you mind discussing your process of making portraits? WC: I think my process is something that’s constantly changing. I photograph my family and friends a lot. When it comes them, I usually schedule a time and try to come up with a location. Sometimes they have places in mind, other times they don’t. I start off the session by taking whatever kind of pictures they want that they can use for their own purposes. After that, I gradually move towards making images that satisfy my needs. Lately I’ve found myself asking strangers to pose for and with me, and for the most part, I use the same approach I take with my family. The big difference is in how I ask them. That varies from person to person, but it is also such an important part of the process. One example would be this amazing experience I had with Kelsey, who is in on of my favorite pictures that I’ve ever made (left). I literally spotted her on campus in a crowd one day, made eye contact, and we randomly started walking towards each other and introduced ourselves. I asked for her phone number and if she could come to my house to let me photograph her. She said yes, and from there we’ve had multiple sessions together and have had her recommend me other people to photograph. I don’t know how to explain it, but there’s something about this way of connecting and being intimate with others that I’m deeply drawn to that feels surreal at times and gets me to excited to do what I do. ZJM: I know that feeling of intimacy well, running into a stranger that you’ve felt you’ve known forever, and knowing that you need to make an image of them. This might be a difficult question to answer because I don’t think I can clearly answer it myself, but how do you think you go about translating that sense of intimacy into the frame? WC: ﻿That is a difficult question and one I’ve been thinking about a lot recently. To me, communicating intimacy can be dissected into different parts or relationships. One relationship is between me and the person(s) I’m photographing and how intimate and comfortable we are with one another. Another aspect of that is how that translates into the two dimensional object that is the photograph and how that informs the connection between the viewer and the subjects in my photographs. I view myself as a mediator between these different facets of communication or exchanges and it can be translated in using various visual cues such as the gaze, body language, posture, environment, and overall comfort of the person being photographed. It is also worth noting that the people I photograph are predominantly black and that alone is a sense of familiarity in me—a black woman photographing other black people. There’s a desire of wanting them to be seen and I’ve been fortunate enough to encounter people who share and embrace that goal in the process of making an image. ZJM: Man, this conversation is starting to feel like I’m talking to myself three years ago. I remember making a promise to myself after my first year of grad school that I would use my camera—and my draw to portraiture—to focus solely on black people. More specifically, using my skills to create positive representations of black individuals. In your work and your previous response, to me, this is undeniable I’d be interested to hear more about your impetus to do this, and maybe some of your thoughts on race and representation in contemporary photography. WC: I think that drive comes from a lot of places that are rooted in my background. One of which is that there are barely any photographs or documentation of my family. My mother’s parents, for example, died before I was born and there aren’t any pictures of them anywhere that I could find. The same thing could be said about my siblings and I, of when we were growing up in Haiti. There is a hole left by the absence of a physical or visual object from that time when I try to tell someone about my childhood. As me and my parents’ generation get older—and having lost the last of my grandparents in recent years—I feel more desperate to have an image of them as a point of reference and remembrance when memories start to fail. In addition to that, I honestly just get fed up with the way people produce and distribute image of black bodies. 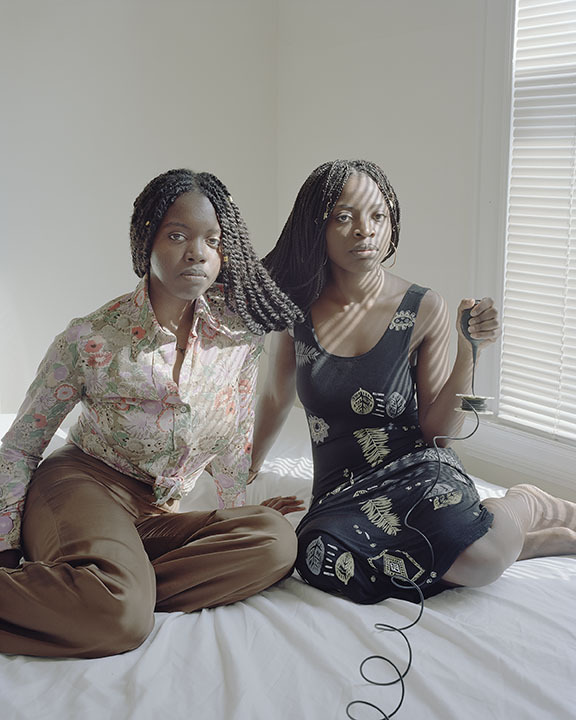 ZJM: I recently read the article Discerning Photography’s White Gaze by Jasmine Weber where she discusses the fact that the top three winners of the Taylor Wessing Prize depict people of color, but the images were all made by white photographers. There are of course a number of articles written on this topic (all easy finds if you’re looking). Could you share your thoughts on it? WC: I definitely think there is a problem concerning representations of blackness, both in terms who feels the need to make the work and who consumes it with regards to galleries, collectors, and other institutions. One of the lures of photography are the endless possibilities of meeting and interacting with people; both those who are like us and those who are vastly different concerning their culture, economic, and racial backgrounds. So as a tool of connection, that’s an amazing feat. But speaking specifically about representations of “othered” bodies, when a white person decides to make photographs of someone outside of their race (or community?) I think they should do so while fully grasping what that means and the history of privilege, power dynamics, and lack of agency that are at work. Historically, photography started as a white man’s tool and medium. That’s still the case today in many ways including accessibility and who gets valued or rewarded for photographing non-white narratives and. That is one area—among others—where institutions fall short. It’s 2019, I don’t think the excuse “we couldn’t find a black photographer” will cut it anymore (not that it ever did). ZJM: If you had the ears of the “gatekeepers”, I’m interested to hear what would you say. WC: Hmm…I don’t think I’d say anything. I’ve been thinking about it also lately, and I believe more in focusing on changing my own actions than those of others. So to that end, I’m more concerned about questioning what role I play in this system as someone who has at one time or another benefitted from these gatekeepers. ZJM: I think I wanted to broach this topic with you not only because it’s been on my mind recently, but also because one question I often get when I present my work is one about “safety”. Did I feel safe photographing in a neighborhood that has historically been coined as “dangerous”. Of course I felt safe because I was in an environment where I was a part of the majority. Further, not once was I approached with an air of suspicion while I was photographing. Such lines of inquiry from an audience, to me, highlights how much work still needs to be done, but the burden of feeling that we are in a position to have to educate often weighs heavy. Do you feel your work is situated in the same vane? Or how do you approach similar predicaments? WC: I’ve definitely had some questions concerning safety when I present my Home Bodies series, luckily not too many. If I had to say, I think those sorts of concerns come from the kind of images we’re so used to seeing in the media of these historically “dangerous” places and the one dimensional views that people from outside of these places have of them. This applies to Haiti in every sense for a number of reasons, including it being the poorest country in the western hemisphere, its constant state of political instability, among other things. And those are the things that are often reinforced in the images disseminated by the media. I would say ignorance is another reason for this safety concern and it does make me question what role I want my work to play out in the world, and if educating others is a part of that? Or is it enough if just certain people fully grasp what I put out, and if that in itself is not another example of elitism similar to the idea of gatekeepers? I don’t know. ZJM: So that you’re still a grad student, I know that focusing on finishing is your primary concern. However, what do you see on the horizon for yourself? What do you think you’ll do once you’re out? WC: I honestly don’t know what I’ll be doing once I graduate. I’m happy that I have until Spring 2020 to be done, but I’m also very excited, scared, and anxious to be out. I’m trying my best to do the things I can only do now while in school and not take this time for granted. I am in the PHOTO-EMPHASIS Break a Leg: Performance-based and Constructed Imagery exhibition, so I’m excited about that. I’m also thinking of making a small limited quantity of special zines this year, so we’ll see how that goes as well as what else this year has in store for me. ZJM: Thanks for taking the time to speak with me, Widline. I’m very excited to see where your career takes you. WC: Thank you so much for having this platform for artists and for including me in it. I really enjoyed this conversation!